Computex 2016: ASUS intros Transformer 3, Transformer 3 Pro, Transformer Mini and ZenBook 3. ASUS today during the Zenvolution press event at Computex 2016 introduced ZenBook 3, an ultra-sleek and lightweight notebook with a premium aluminum design, along with Transformer 3, Transformer 3 Pro and Transformer Mini. 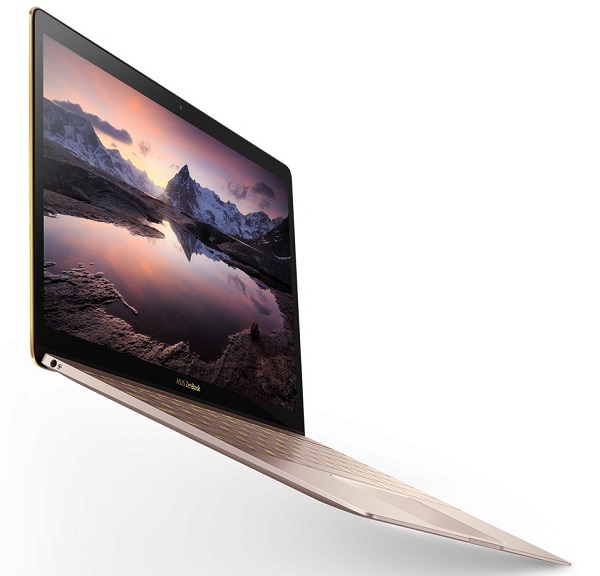 The next-generation ZenBook is completely redesigned with an ultra-sleek 11.9mm chassis that weighs a mere 910g. To achieve its amazing lightness without compromising strength, ZenBook 3 is crafted from aerospace-grade aluminum alloy, a premium material that is 50% stronger than the standard alloy used in laptops. As well as being strong and light, this material is also supremely elegant and features the signature ZenBook spun-metal finish. ZenBook 3 is available in three exclusive colors - Royal Blue, Rose Gold and Quartz Grey - and a special 2-phase anodizing process is used to create stunning golden highlights on the diamond-cut edges. ZenBook 3's high-resolution 12.5-inch display has a wide 72% NTSC color gamut and has an edge-to-edge covering of tough, scratch-resistant Corning Gorilla Glass 4. A slim bezel design provides an 82% screen-to-body ratio for the maximum display size with the minimum footprint. ZenBook 3 has an innovative cooling system featuring the world's thinnest fan design at just 3mm. This efficient cooling enables ZenBook 3 to achieve incredible performance in an ultra-thin from factor. ZenBook 3 delivers unprecedented performance with an Intel Core i7 processor, 16GB of 2133MHz RAM, up to a 1TB PCIe Gen 3 x4 SSD, a next-gen USB Type-C port, and powerful quad-speaker audio by Harman Kardon. ZenBook 3 provides up to 9 hours of battery life for all-day computing. When it's time to recharge, fast-charge technology brings ZenBook 3's battery up to 60% capacity in just 49 minutes. ZenBook 3 features a full-size backlit keyboard with 19.8mm key pitch - the same as most desktop keyboards - and 0.8mm key travel to deliver comfortable typing experience. A glass-covered precision touchpad provides smooth and accurate input and incorporates palm-rejection technology, Smart Gestures, and handwriting support for enhanced usability. A built-in fingerprint reader with Windows Hello support gives users instant one-touch access, allowing them to sign in and unlock ZenBook 3 quickly and securely without having to type their password or PIN. ASUS Transformer 3 Pro is a 2-in-1 PC that features a beautiful 12.6-inch display with a resolution of 2880 by 1920 and a 275ppi pixel and a gamut of 121% sRGB color space for rich, vibrant colors. Dual front stereo speakers with audio by Harman Kardon provide spacious, defined sound for incredible listening experiences. Precision crafted from aluminum, ASUS Transformer 3 Pro is only 8.35mm thin, yet has incredible structural strength and rigidity. ASUS Transformer 3 Pro has diamond-cut detailing that accentuates its elegant design, and it is available in gorgeous Icicle Gold and Glacier Gray color options. ASUS Transformer 3 Pro has an integrated metal kickstand with a stepless hinge that lets users set the device at almost any viewing angle up to 170°. The included ASUS Transformer Cover Keyboard is a backlit keyboard that provides laptop-grade 1.4mm key travel for a comfortable typing experience and is available in four attractive colors - Stone, Charcoal, Taupe, and Amber - that perfectly complement the device. ASUS Transformer 3 Pro is powered by an Intel Core i7 processor and has up to a 1TB PCIe x4 SSD and 16GB of 2133MHz RAM for the ultimate performance. Its versatile, any-way-up USB Type-C connector supports USB 3.1 Gen 2 devices at speeds up to 10Gbps, and Thunderbolt 3 provides unbelievably fast 40Gbps data transfers and support for dual external 4K UHD displays. ASUS Transformer 3 Pro also comes with USB 3.0 and HDMI ports for convenient connectivity. A 13MP rear camera lets users capture high-resolution photos and videos, and a front-facing camera with Windows Hello facial recognition enables users to conveniently log in with just a quick glance. 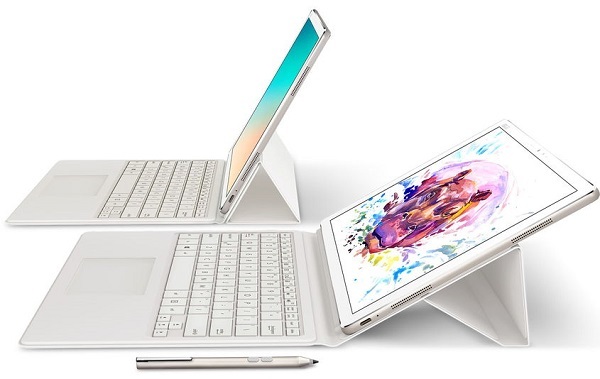 ASUS Transformer 3 Pro is expandable with a range of accessories that extend its functionality and performance, giving users a new level of flexibility and convenience from a mobile device. ASUS Pen is a beautifully crafted writing and drawing utensil that offers 1024 levels of precision for completely natural note taking and sketching experiences with a high degree of control. Users can also capture photos with ASUS Transformer 3 Pro's high-resolution camera and annotate them directly with ASUS Pen. ASUS Universal Dock is a hub that provides a full range connectivity ports, including USB-C 3.1, USB 3.0, HDMI, VGA, RJ45 LAN, and a 3-in-1 SD card reader. ASUS Audio Pod is an entertainment accessory that includes four powerful speakers to deliver amazing 360° virtual 5.1-channel surround sound and with rich, defined bass. ROG XG Station 2 is an external graphics card dock that gives ASUS Transformer 3 Pro desktop-grade graphics performance, turning it into a VR-ready gaming powerhouse. ASUS Transformer 3 is an ultra-slim and compact 2-in-1 PC that comes with a beautiful 12.6-inch display with a resolution of 2880 by 1920 and a 275ppi pixel density as well as 450cd/m2 brightness and a gamut of 121% sRGB color space for rich, vibrant colors. ASUS Transformer 3 delivers enhanced video performance with ASUS Tru2Life Video technology, which optimizes every pixel in each frame before it is displayed, resulting in superior contrast and clarity for the best, most realistic video quality. Precision crafted from aluminum, ASUS Transformer 3 weighs just 695g, is only 6.9mm thin, and has smaller dimensions than a sheet of A4 paper. Its compact and elegant design is accentuated by diamond-cut edges and an exquisite spun-metal finish. Equipped with the detachable ASUS Transformer Sleeve Keyboard that has 1.4mm key travel, an integral 2-position display stand, and a glass-covered precision touchpad, ASUS Transformer 3 provides comfortable typing and smooth, accurate input for the best productivity and creativity experiences. 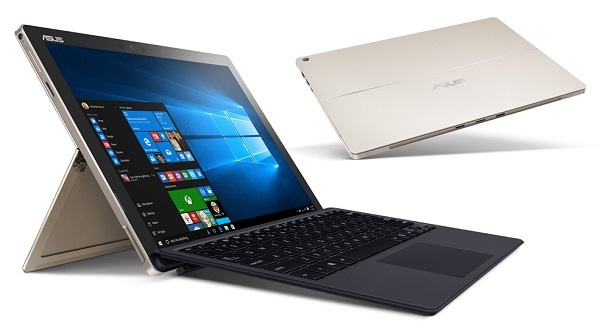 ASUS Transformer 3 is available in gorgeous Icicle Gold and Glacier Gray color options. The ASUS Transformer Sleeve Keyboard is available in four attractive colors - Stone, Charcoal, Taupe, and Amber - that perfectly complement ASUS Transformer 3. ASUS Transformer 3 contains four high-quality speakers with audio by Harman Kardon. Each speaker is powered by a smart amplifier to deliver rich, detailed, and immersive sound, even at loud volumes. ASUS Transformer 3 automatically adjusts the direction of the sound depending on the orientation of the device, ensuring users will always enjoy optimum audio quality. Transformer 3 is powered by 7th Gen Intel Core processors and has up to a 512GB SSD and up to 8GB RAM. Its versatile, any-way-up USB Type-C connector supports USB 3.1 Gen 2 devices at speeds up to 10Gbps, and Thunderbolt 3 provides unbelievably fast 40Gbps data transfers and support for dual external 4K UHD displays. 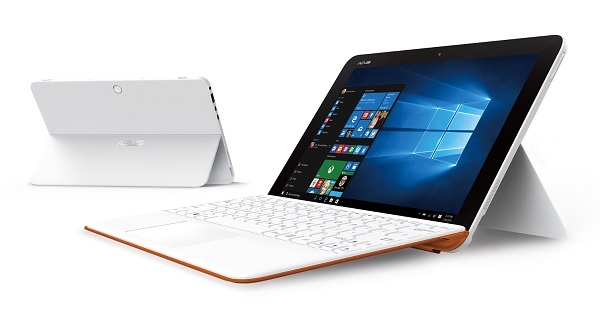 A built-in fingerprint reader and Windows Hello lets users sign in to and unlock ASUS Transformer 3 quickly and securely without having to type their password or PIN. ASUS Transformer 3 also includes a 13MP camera for capturing high-resolution photos and videos. ASUS Transformer 3 is expandable with a range of accessories - including ASUS Pen, ASUS Universal Dock, ASUS Audio Pod, and ROG XG Station 2 - that extend its functionality and performance, giving users a new level of flexibility and convenience from a mobile device. ASUS's Transformer Mini is the world's lightest 2-in-1 PC. The Transformer Mini features a 10.1-inch display with 400cd/m2 brightness and ASUS TruVivid display technology that reduces reflections for a rich, vibrant picture in all lighting conditions. ASUS Transformer Mini also delivers enhanced video performance with ASUS Tru2Life video technology, which optimizes every pixel in each frame before it is displayed, resulting in superior contrast and clarity for the best, most realistic video quality. ASUS Transformer Mini is equipped with a USB port, 802.11ac Wi-Fi, and provides up to 11 hours of battery life. With a premium magnesium-aluminum alloy design, ASUS Transformer Mini weighs just 790g with the keyboard attached and only 530g as a tablet and is only 8.2mm thin. The brand-new ASUS Quick Launch makes using ASUS Transformer Mini more convenient and efficient with simple on-screen gestures that enable users to quickly launch apps, wake ASUS Transformer Mini, and put it into sleep mode. ZenSync smartphone integration lets users reply to text messages, copy and paste text, and transfer files to ASUS Transformer Mini.